Like the name suggests, the Chihuahua Terrier mix is just that. Intrigued to know what happens when we mix the bossy but loving Chihuahua with the tireless and intelligent terrier breeds? Read on to see if this small, but, sassy dog could be for you. Free Giveaway: Download a free owner’s guide to learn more about this mixed breed dog. Just what it says on the tin, the Chihuahua Terrier mix can be a particularly diverse dog. 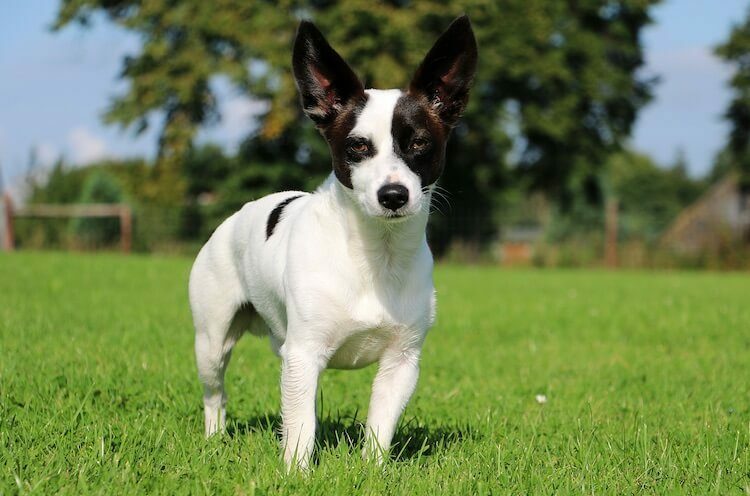 This sassy pooch is a result of cross breeding a Chihuahua with one of the many terriers. As you probably know, there are several terrier breeds registered with the American Kennel Club. They are loved for their tenacity and feistiness. Rat Terriers are revered for their intelligence – not that old a breed, they first appeared in the States around the 1920’s-1930s. Larger in size than other Terriers, when a Chihuahua is crossed with this Terrier, they are usually on the larger size of the scale (i.e. closer to 20 pounds). The Jack Russell Terrier is adored for its tenacity. They are fearless, athletic and thrive in active homes and are particularly partial to agility or flyball sports. Fox Terriers can be smooth, or wire coated; similar in temperament, it is just their appearance that differs. Described as independent, this is just a nice way of saying they will sometimes frustrate you. Super energetic, these guys need an active home too. We know that most Terriers have similar characteristics; active, alert, intelligent and independent. What happens then when we mix one of these Terriers with a Chihuahua? The Chihuahua is charming and graceful; originating in Mexico, they have become a popular purse dog to the rich and are famous for their use in mixed breeds. They are loved for their small size; suiting smaller homes and city living. Chis are alert, lively and feisty, sometimes stubborn and independent like some Terriers too. What we end up with then is double the trouble – the intelligence and energy from the terrier and the feisty bossiness from the Chi. As this mix is a hybrid dog, it’s not yet recognized by the American Kennel Club, yet some of the mixes, like the Chihuahua cross Yorkshire Terrier are recognized by the International Designer Canine Registry. For a Chihuahua Terrier Mix Puppy, the price ranges between $400 – $800 USD. The higher price tag can often be associated with the mother being a Chihuahua as they can suffer more health complications during labor. 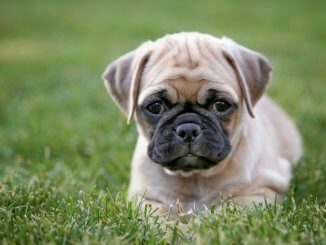 Litters are generally small so you many find reputable breeders operate a wait list. Despite the range of terriers that are often mixed to produce this alert and intelligent pooch, their temperament is often similar. 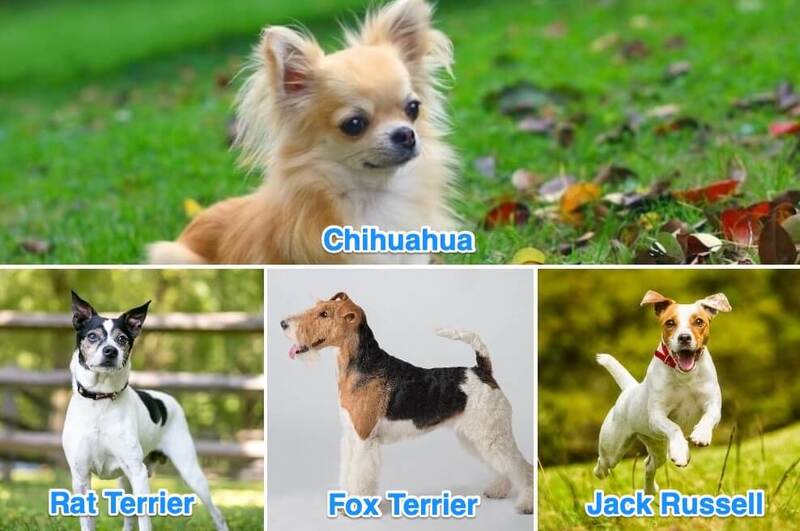 As we know, we can never be 100% on the result of a hybrid – they could be more Chihuahua than Terrier or vice versa. In general, this mix is a high energy and athletic dog. 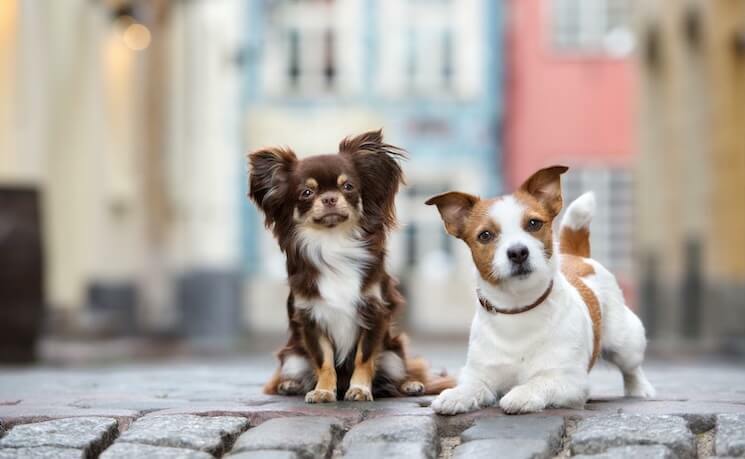 They are often intelligent and alert, but if they have retained the stubbornness from the Chihuahua, they can be a challenge to train – housebreaking especially so. The Chihuahua Terrier Mix suits active, adult only homes. Due to their small size, they don’t tolerate rough play from young children, and with the Terrier hunting genes, they may nip. 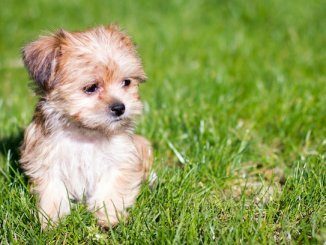 They suit owners who have time and patience to tackle early and continued socialization and training to ensure they don’t develop “small dog syndrome”! More often than not, small dog syndrome isn’t particularly breed specific, it’s just some owners think they don’t need to train a small dog as much as they would a large dog. If a small dog is barking at something and becomes scared; you may choose to pick the dog up to remove them from the situation. You couldn’t do this with a large dog, you would have to distract and encourage a different behavior or pair with a reward. The small dog learns to jump at the owner to be picked up in a fear response, whereas the large dog learns to retreat which is a much better coping mechanism. 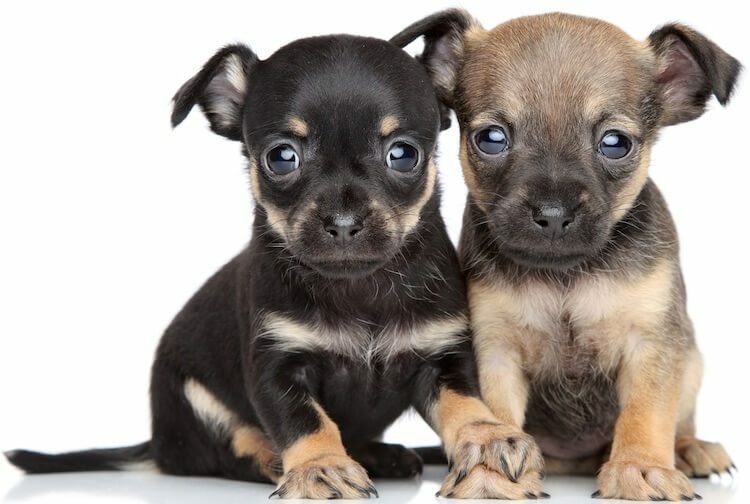 The Terrier Chihuahua Mix, when socialized well can tolerate other dogs, but, is less sociable than most – they tend to prefer human company. Chihuahuas are often described as clan dogs – where they would be more likely to tolerate another dog of the same breed or similar size. Due to the Terrier’s hunting backgrounds, careful socialization is necessary if you expect them to live with other dogs or family pets. Let’s see what a day in the life of caring for this dog looks like. As we’ve mentioned, this dog is best suited to active, adult only homes. They require patient owners who understand their needs. Being small in size, their daily calorie intake is pretty low too. This makes feeding this mix very easy. On average they will eat around 40 calories per pound of body weight per day. Chihuahua’s struggle particularly with the cold, so if your dog has retained more of their Chihuahua parent you may notice they use more calories in colder weather, trying to keep warm. A typical size mix will be around 15 pounds in body weight which will set their typical daily intake at around 600 calories. A good quality food should meet their daily nutritional requirements including enough protein and fat. Protein is crucial for the development of your puppy, look for a kibble feed, or raw feed, with a high percentage of protein formula. Your tireless Terrier will certainly use that. Small breeds often gain weight easily – as they are fed table scraps. Monitor your dogs daily intake if you are ever worried about his weight. Being more challenging to train (due to their Chihuahua stubbornness), you may be more tempted to use more treats to encourage the behavior you want – consider using low calorie treats instead. You should be able to see his waistline and his ribs should be palpable. From a birds eye view he should have an hour glass figure to his body. Not only does food intake affect weight, so does your dog’s activity. 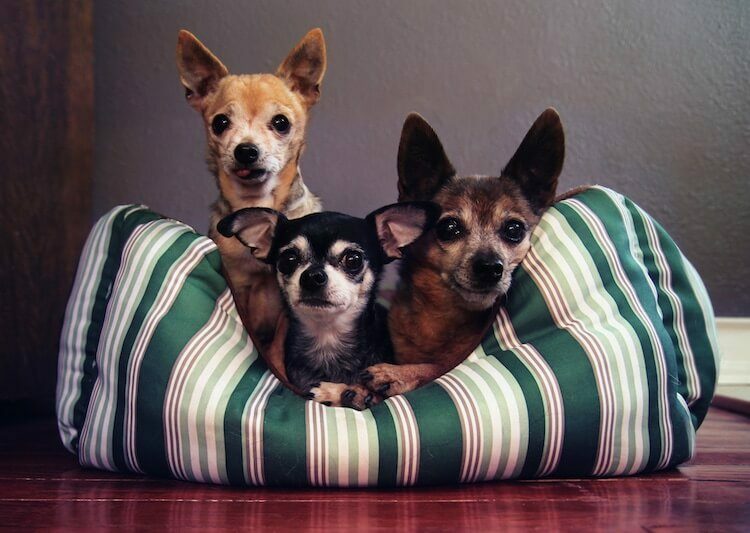 Keeping the Terrier genes, the Chihuahua Terrier mix is often energetic and fatigue-proof. This dog will need upwards of 60 minutes of exercise per day. If you thought this small pooch could be a couch potato, you couldn’t be further from the truth. If you’re looking for a couch potato try his cousin. They love being busy and, despite their small size, can tolerate long walks easily and safely. It is best to walk them on leash though – the Terrier in them may decide to set to chase. Despite their intelligence, that chase is much more exciting than you (usually)! Their less-sociable-than-most-dogs nature can mean dog parks are harder to navigate, they may be barky towards other dogs, or even nip. The best way to tackle this is to socialize them from an early age and help them make the association that other dogs can be fun to be around. Not only does their body like being active, so does their mind. As we have mentioned, this small dog is super intelligent. The issue is if they’ve retained the stubborn streak from their Chihuahua parent – this can make training more challenging. All dogs respond best to positive reinforcement and reward-based training. Start socialization young, introduce them to people, animals, machines, equipment – everything they will tend to come across on a typical day. Remember we mentioned how some often develop “small dog syndrome”, train your small pooch as you would a large pooch. Any behavior you wouldn’t expect from a large dog; jumping up, lunging, excessive barking or nipping; don’t accept from your small dog. Luxating Patella is very common in small breeds. This is where their kneecap dislocates from its normal position. Hydrocephalus, also known as water on the brain, is common in small, toy breeds. This causes increased pressure within the skull, causing brain damage and is often fatal. Heart Disease – this can often be inherited and limits the heart’s ability to pump blood around the body. There are a range of symptoms including lethargy, fatigue, coughing or respiratory distress. Due to the range of Terriers found in this mix, their appearance can vary significantly. In addition to color variation, they can be long or short coated, depending on their Chihuahua and Terrier parents. Some are smooth coated, some are wire coated (e.g. a Rat Terrier Chihuahua Mix). Look at the parents to get a better idea of what your mix will look like. Is the parent a deer head or apple head Chihuahua? Long or short coated? Is the Terrier a Fox Terrier? Are they smooth coated or wire coated? A Yorkshire Terrier parent may provide a black Chihuahua Terrier Mix. A Jack Russell parent may provide white and tan coloring. Their grooming requirements will depend on their coat type. In general, most coats require brushing 2-3 times a week. Speak with a qualified groomer to gain an understanding of your mix’s coat and how best to maintain it. 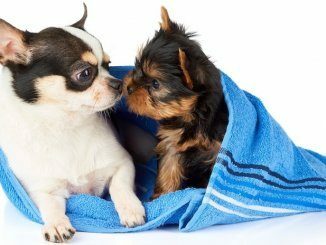 Due to their small size, you may find it pretty easy bathing them at home to keep their coat smelling sweet. Wiry coats can be quite oily and appear dirty. Along with regular brushing, they will need their ears and eyes checked over and weekly teeth brushing. The sweet but sassy Chihuahua Terrier mix – not everyone’s cup of tea, but for active adults who like a bit of character this could be a contender. Early socialization and training are vital in reducing the chances of him developing small dog syndrome. He needs an owner who understands his character and has the patience to train through his stubbornness. Reward-based training and positive reinforcement gives you the best shot here and as a result you will have a fearless and feisty dog; loyal with his whole heart.